What the experts are already saying about All In! All In is full of real-life, hard-won, street-smart lessons that are entirely applicable and transferable to any business. This book is a look at the mind of a saavy, street smart entrepreneur and will help you on your journey of building a successful business. 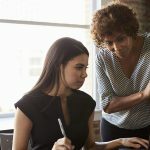 The idea of guiding a company from the minor to the big leagues of business can be exhilarating, but also daunting without a detailed set of directions. All In provides those directions with humility, comedy and street smarts. 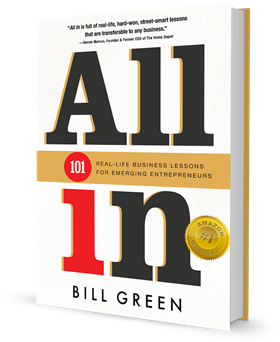 Bill Green’s All In is more than just a how-to guide for building a successful business. It’s one man’s story of how good, old-fashioned hard work, passion and great instincts created opportunities, then success and, most importantly, a great life. An amazing book that reveals the sometimes elusive insights that entrepreneurs need for success. This is a great American success story of perseverance and overcoming adversity, to build a great business. The lessons Bill teaches are invaluable insights for people to become transformative entrepreneurs. How refreshing! This book will enlighten true entrepreneurs! It is an absolute must-read for entrepreneurs who are serious about success. Bill Green’s All In brings to life the very essence of capitalism, demonstrating that hard work and ingenuity can pave the road to the American Dream. A must-read that will inspire young entrepreneurs. 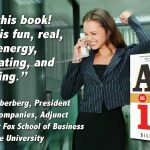 All In is an important book for anyone who is intent on building a meaningful business career. In simple terms, Bill describes how hope, desire, and a ‘take no prisoners’ attitude can lead to success beyond what most people can imagine. I highly recommend this book to aspiring entrepreneurs. 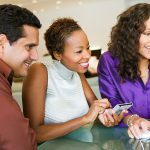 Buy it, use it and you will grow your business! All In is more than a how-to guide, it’s a ‘how he did it’ guide that should convince anyone thinking about starting a business that they don’t need a fortune to start one. Love this book! All In is fun, real, high-energy, motivating, and inspiring. Organized, driven, focused: all qualities that have enabled Bill Green to succeed in multiple business ventures.This book reflects who he is and why others can learn from his pearls of wisdom. I love Bill , not just for his business skills but for his thirst to succeed at whatever he attempts. The Idea, the Team, the Customers– and, of course, the Entrepreneur. Most people have no idea what it really means, professionally and personally, to be an entrepreneur, much less to have repeatedly succeeded as one. Bill Green has, and in this book, he covers the journey from idea through sale and back again. If you’re an entrepreneur, or aspire to be one, this book is well worth your attention. Bill Green takes readers on his delightful, humorous, and sometimes painful journey as a serial entrepreneur. Through engaging stories revealing valuable lessons that can’t be learned in textbooks, aspiring entrepreneurs will discover that starting a business is the hardest work they’ll ever do, but doing the work will reward them with a lifetime of opportunities. All In is a quick read with hands-on, practical advice from an accomplished entrepreneur who’s cracked the code of success. Readers will laugh and nod as they consume creative lessons that can’t be taught from a a traditional classroom setting. Highly motivational and perfect for any savvy businessperson looking to grow his/her venture. It’s great to read a book about business by an entrepreneur like Bill Green who really knows business. His life experiences will inspire readers to become successful entrepreneurs and prepare them to break through the barriers to grow and climb the ladder of success. All in: 101 Real Life Business Lessons for Emerging Entrepreneurs by Bill Green is a non-fiction book with strategies and tips on how to become a successful entrepreneur and build a thriving business. Bill Green draws upon his own experience in the business world to share his insights in this book. It is extremely detailed, is laid out meticulously, and covers all aspects of creating a brand and successful business, which includes both real world strategies as well as the will and ambition that is needed to go along with it. All in: 101 Real Life Business Lessons for Emerging Entrepreneurs is divided into chapters and sub-chapters, including dreaming big, how to spot and capitalize on opportunities, the importance of will and the drive to succeed, customer service and relationship building, team building and leadership skills, growth and expansion through mergers and acquisitions, the pros and cons of private versus publicly traded companies, investments, planning for retirement, and more. All in: 101 Real Life Business Lessons for Emerging Entrepreneurs is a great read and a useful one for budding entrepreneurs. In fact, I would recommend this even to teenagers or students who are just starting out and who have big dreams. This is especially true for those who don’t currently have a good mentor or guide that they trust. This book can certainly provide guidance and real-world practical tips on how to become a successful businessperson, provided one has the skills and the will. The writing is fluid and very engaging and really connects with the reader. I found a lot of tried and tested truths in this book and would recommend it to anyone.